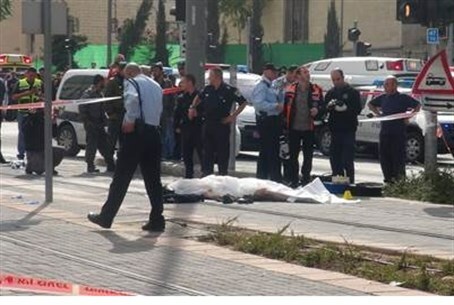 60-year-old Abd al-Karim Nafith Hamid was injured in November 5 attack at Jerusalem light rail station. A Palestinian man who was injured in the November 5 car attack at a Jerusalem light rail station outside the Old City succumbed to his wounds Sunday. Abd al-Karim Nafith Hamid, 60, was injured when terrorist Ibrahim al-Akkari plowed his car into a group of pedestrians, killing a border police officer and a 17-year-old yeshiva student, and wounding 12 others. Bethlehem-based Ma'an News Agency said he had suffered multiple fractures to his spine and feet in the attack, and subsequently had a heart attack. It quoted his widow as claiming he did not receive treatment because he was Arab, but then added: "He has been in an intensive care room and he was given all the necessary surgeries, but he was declared dead today." Hamid, a resident of the Arab village of Anata, east of Jerusalem, leaves behind 12 children and two widows. Al-Akkari, who was affiliated with the Islamist Hamas terrorist group, rammed his car into two separate groups of pedestrians at the Shimon Hatzadik train station, located on Shimon Hatzadik street north of the Old City and not far from the Municipality building. He then exited the vehicle waving an iron bar, but was shot dead by border policemen.